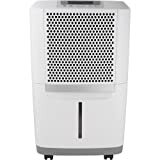 Frigidaire – FAD504DWD: Dehumidifier Review • The Air Geeks, reviews of air conditioners, dehumidifiers and air purifiers. You should not expose yourself to bacteria and other pathogens by allowing them to breed in your room. A dehumidifier eliminates them and ensures that the air in your house is clean and free from excess moisture. The FAD504DWD is a highly effective dehumidifier that claims to remove up to 50 pints of moisture your interior air in 24 hours. Engineered by one of the most renowned brands in the sector, the American Frigidaire, it is acclaimed as one of the best value unit on the market. With good reason? Our tests will try to answer to that. Its high dehumidification capacity on a low energy consumption. 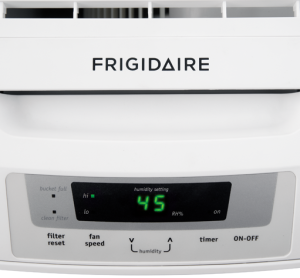 The Frigidaire is 20% more energy-efficient than previous model (One pint of water extracted from the air will consume 254 watt-hours, compared to 295 for older models). Its quiet operation. The dehumidifier has 2 fan speeds, and even the higher one cannot be heard from two rooms down. It is always important to consider the size of your room before you select a dehumidifier. For better results, the capacity of a dehumidifier should match the size of your house. High capacity dehumidifiers are ideal for large spaces and vice versa. The FAD504DWD is an ideal option for small and medium-sized rooms. Sometimes you may need to move your dehumidifier from one position to another for better results. If that is the case, then you need a unit that you can easily move from one room to another conveniently. The FAD504DWD features caster wheels and you can easily move it from one position to another by pushing it. In addition, it features a top handle and side handles to make it easy for you to move it. Its small size (25 inches tall) and light weight (37 pounds when the tank is empty!) are very satisfactory, especially considering the efficiency of this unit. The air we inhale is full of bacteria and other harmful microorganisms. They not only make it difficult for you and your family to breathe comfortably but they can also spread illnesses. This dehumidifier is designed to eliminate these bacteria before they find their way into your lungs. Apart from removing bacteria, the washable filter removes airborne particles and room odors as well. In case you have been experiencing difficulties when breathing, then this unit is an ideal option for you. Some humidity control units require regular user attention while other are designed to run for long without it. 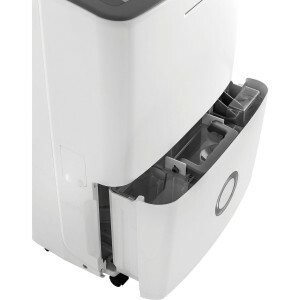 This portable dehumidifier is designed to allow effortless humidity control. It allows you to set the exact amount of humidity that you want in your room as a percentage. In case you don’t want to empty the reservoir on regular basis, you can connect your dehumidifier to a suitable drain for continuous operation. By doing this, you will enable your unit to run without requiring your attention or shutting off to avoid spillage, and let its ~10 minutes cycles (fan + compressor for 5 minutes, than fan only for 5 minutes) dry your room to a nice and comfortable level of humidity. To ensure that no water spillage occurs when the tank is full, this unit features an alert system (beeper) to notify you that you need to empty the tank. Its auto shut-off mechanism stops the unit from running when the tank is full. This helps to avoid water spillages. Furthermore, the collection tank of the FAD504DWD is easily accessible. The FAD504DWD is an Energy Star rated product that is optimized to consume minimum energy. Its operation does not have a significant effect on your electricity bill and it is therefore an ideal choice for people who want to save money. Minimum energy usage. This unit has lower energy needs than most dehumidifiers of same capacity, particularly 20% lower than previous generation dehumidifiers. Good news for your wallet! Very effective dehumidification. This portable unit works impressively well in small and medium rooms. Quiet operation. Its fan and its compressor together run more quietly than most systems of same capacity. Automatic shutoff can turn inoperative. Some users have reported water spillages once the tank is full, despite the fact that this unit is supposed to shut off automatically in such cases. However, such complains are few. All I can say is that this thing works like crazy. It takes out a huge amount of moisture and is quiet! Not silent but not to noisy at all IMHO. We watch TV in the basement while it is running and it does not disturb our viewing. I like the relative humidity read out so you know what it is. My basement used to have a slight musty odor. It now has no odor at all and is more comfortable, just like the upstairs." I've purchased many dehumidifiers over the years and I have to say that this is one of the quietest I've ever seen. It is also very efficient in removing humidity from several rooms. This is the 3d unit I purchased... I purchased two from abt dot com for my home and this one from Amazon for a friend's home. I set them on continuous run but have them plugged into an appliance timer for better control and also plugged into a surge protector. Usually have to empty the bucket at least once a day because they are so efficient." The FAD504DWD, a 50-pint humidity control system by Frigidaire, is overall an excellent choice. Quiet, effective, it is also wallet friendly : affordable in the short run, and cost-effective in the long run as it saves mors energy than its competitors. Although most users have expressed satisfaction with this unit, some have revealed that they had to request for replacement because they had received defective units or cases of water leakages. For us at the Air Geeks, having considered the features and the performance of this unit, its excellent rating is well deserved!